"Shirley Kidd started making these treats after tasting a batch her friend whipped up. 'I immediately requested the recipe and have been baking them by the dozens ever since,' she enthuses from her home in New London, Minnesota. 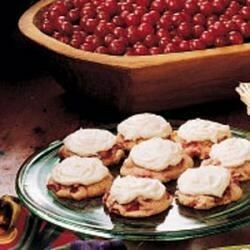 'The icing is an ideal complement to the tart berries in the cookies.'" In a mixing bowl, cream butter and sugars. Add milk, egg and orange juice; mix well. Combine the flour, baking powder, salt and baking soda; add to the creamed mixture and mix well. Stir in cranberries and nuts. Drop by tablespoonfuls 2 in. apart onto greased baking sheets. Bake at 350 degrees F for 12-15 minutes or until golden brown. Cool on wire racks. For frosting, heat the butter in a saucepan over low heat until golden brown, about 5 minutes. Cool for 2 minutes; transfer to a small mixing bowl. Add sugar and vanilla. Beat in water, 1 tablespoon at a time, until frosting reaches desired consistency. Frost the cookies.